This afternoon we took taxis to Camara de Lobos, a suburb of Funchal about a twenty-minute drive from our hotel. 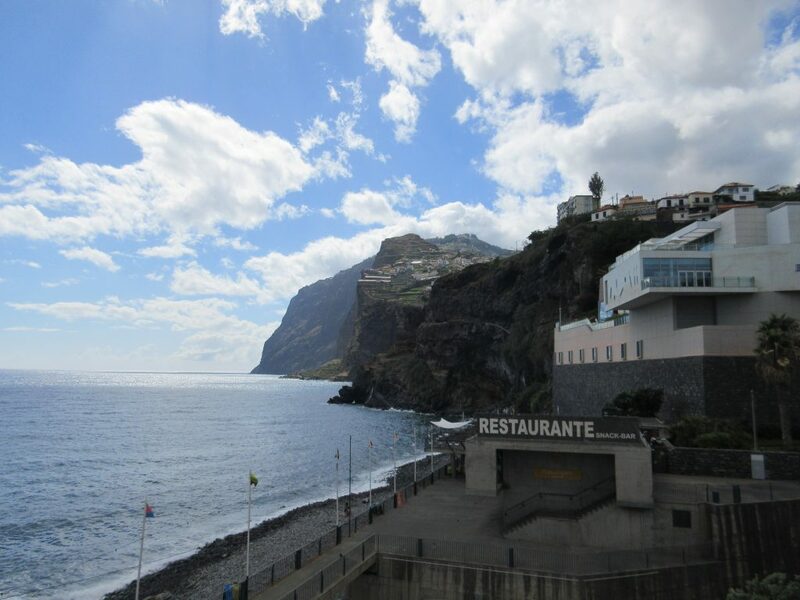 This town is believed to the original landing point of the Portuguese discoverer Joao Gonçalves Zarco, who is credited with the discovery of the Madeira Islands in 1419. The name Lobos is a Portuguese derivation for sea-lions which were found in the area. The name means the place where sea-lions are. Camara de Lobos is the second largest settlement with about 30,000 residents. It has a very young population with 45% of the population being under 25 years of age and 23% being seniors. Agriculture and fishing are still considered the primary sources of income although tourism is growing in the area. Bananas can be seen growing on steep terraces up the hillsides and the harbor is filled with small fishing boats. There was a large celebration going on in town this week in honor of St. Peter the protector of the fishermen. In addition to that festival there was also the black scabbard fish festival or “Festa da Espada Preta” with entertainment live music, traditional dancing, a firework display and food stalls around the port. The black scabbard is one of Madeira’s gastronomic specialties. This festival also pays tribute to the local fishermen who for generations were the only ones on the island who devoted themselves to catch this type of fish. 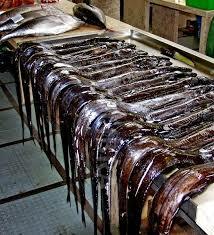 The black scabbard fish are very long and thin growing up to 42 inches in length and weighing up to 15 pounds. 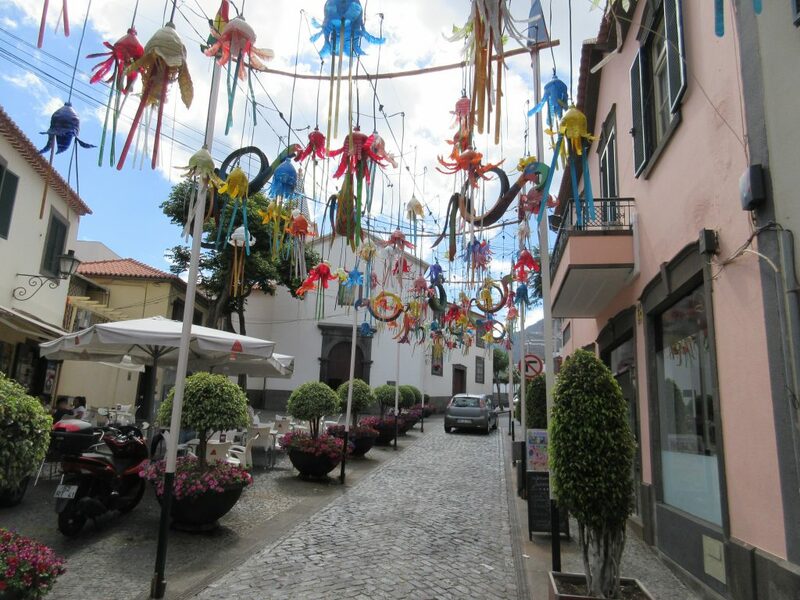 The town streets were decorated extensively with mostly homemade decorations made from recycled materials. 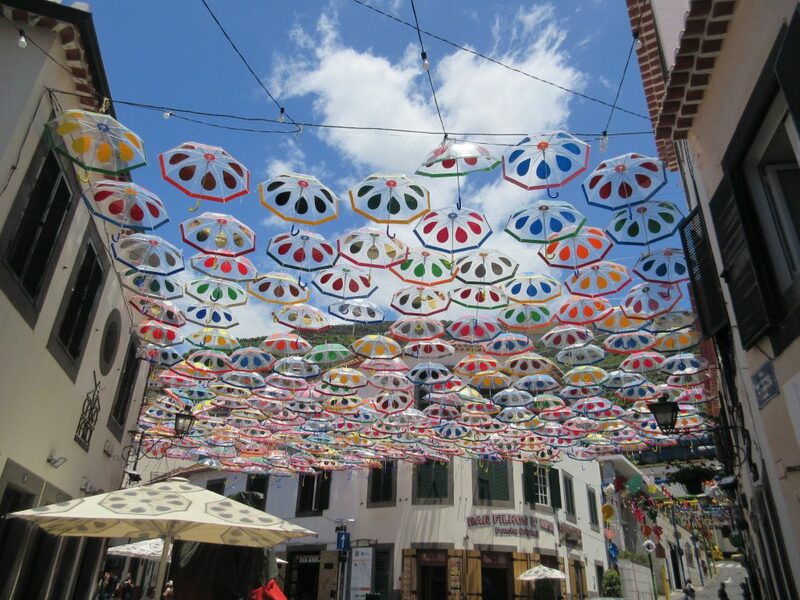 They use soda bottles, water bottles, old tires, aluminum cans and other materials to create elaborate colorful decorations mostly hung from wires overhead. 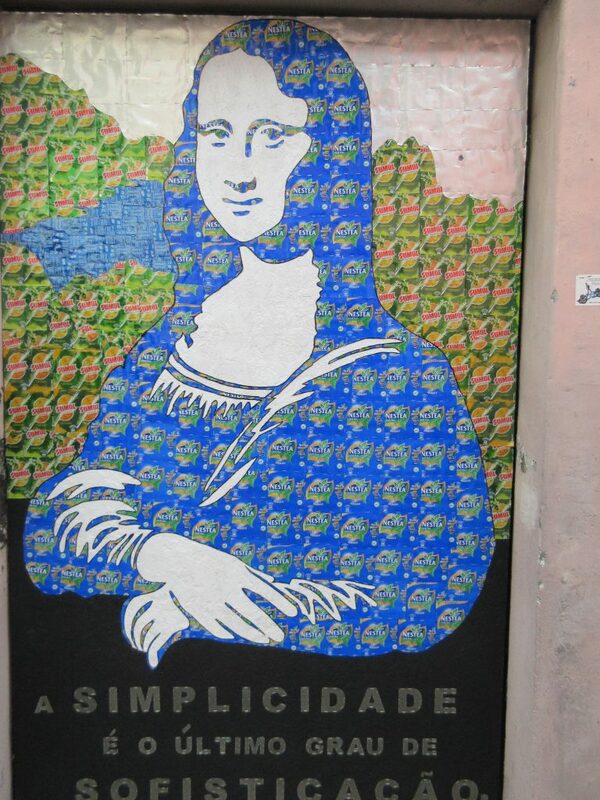 Also, of note was the local door and wall art along the streets created out of recycled aluminum cans. They would cut soda cans into small shapes to create notable figures like the Mona Lisa, Elvis, Madonna and Snoopy characters. For lunch we ate on a lovely patio terrace overlooking the harbor at a restaurant called the Taberna Dos Lobos. 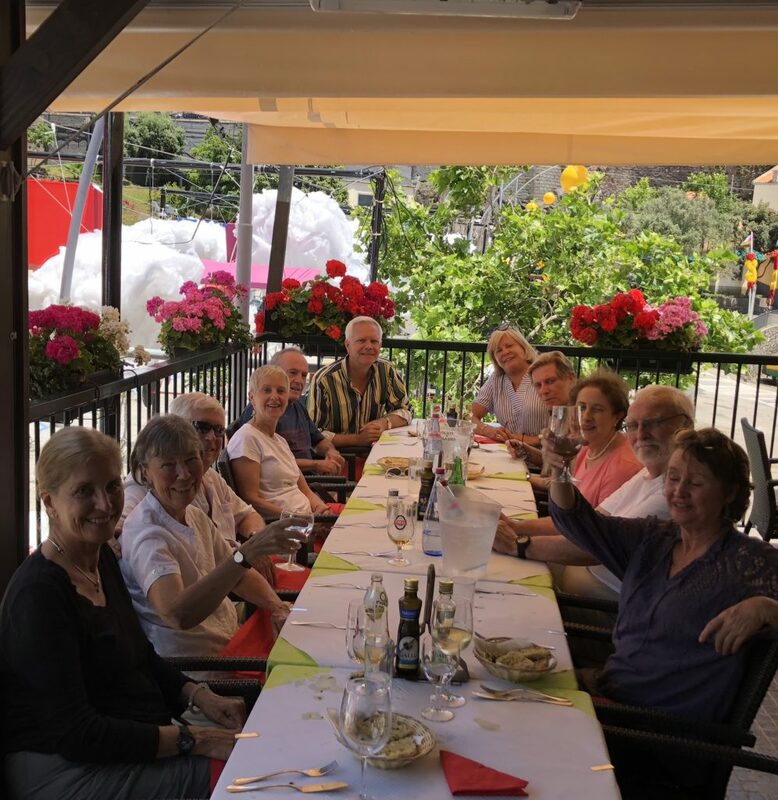 The lunch was more like a feast that lasted for about three hours and was more food than any one person should eat at one sitting. We started out with drinks followed by a shared plate of shellfish unlike anything I have seen before. The shells were very flat with jagged edges and contained small mussels of some type. This was followed by a shared plate of breaded and deep-fried fish served with raw onions. Next, they served platters of salads made from lettuce, cucumbers, tomatoes and shredded beets. Next, we had platters of corn meal with herbs formed into good sized cubes and deep fried. Then came whole potato’s that were roasted and then smashed flat. Next, came the entrée of calamari, shrimp and two types of white fish cooked whole with the heads and tails still intact. For dessert they served banana splits of whole bananas with ice cream and a caramelized sugar sauce. This was followed by espresso coffees and a local drink called Poncha made from orange juice, lemon juice, honey, sugar and a local liquor made from distilled sugar cane juice. It was all very delicious but way too much. Needless to say, once we returned to the hotel, we did not need or eat any dinner. We retired early.